As many of you know, I am fortunate enough to get to work from home a couple of days per week. Up until the last few weeks, I have never really worked while I was at home by myself with the boys - except for naptimes. Instead, I worked at night when the boys went to sleep. Well, that has gotten old really quickly, so I decided to try something new. We have a SuperYard that we keep in the living room. 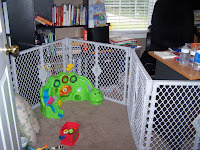 It is a gate-type thing that keeps the boys in one area (except they can escape sometimes :)). 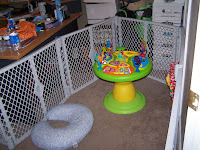 Anyway, I have figured out how to put the gate in my office, and use Charlie's gate down the hall, to create a good play area for the boys while I work. So far it has worked pretty good. 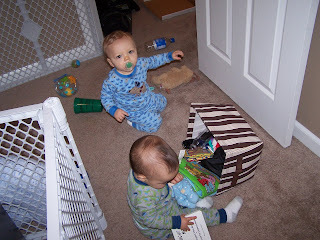 It is so much fun taking the boys to work with me, although I do have to stop every now and then to break up a fight :). Here are some pictures. 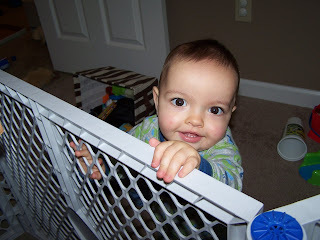 Carson comes over to say "hi!" Your SuperYard is neat! 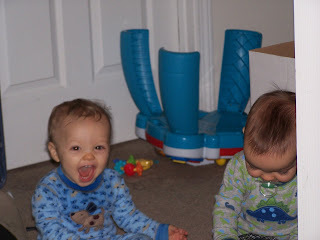 It's nice Hayden and Carson can play together while you work. Looks like they have a lot of fun!